Farrar, Straus and Giroux, 9780865478732, 272pp. Siddhartha Deb grew up in a remote town in the northeastern hills of India and made his way to the United States via a fellowship at Columbia. Six years after leaving home, he returned as an undercover reporter for The Guardian, working at a call center in Delhi in 2004, a time when globalization was fast proceeding and Thomas L. Friedman declared the world flat. Deb's experience interviewing the call-center staff led him to undertake this book and travel throughout the subcontinent. The Beautiful and the Damned examines India's many contradictions through various individual and extraordinary perspectives. With lyrical and commanding prose, Deb introduces the reader to an unforgettable group of Indians, including a Gatsby-like mogul in Delhi whose hobby is producing big-budget gangster films that no one sees; a wiry, dusty farmer named Gopeti whose village is plagued by suicides and was the epicenter of a riot; and a sad-eyed waitress named Esther who has set aside her dual degrees in biochemistry and botany to serve Coca-Cola to arms dealers at an upscale hotel called Shangri La. Like no other writer, Deb humanizes the post-globalization experience—its advantages, failures, and absurdities. India is a country where you take a nap and someone has stolen your job, where you buy a BMW but still have to idle for cows crossing your path. 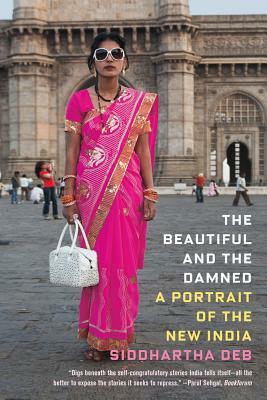 A personal, narrative work of journalism and cultural analysis in the same vein as Adrian Nicole LeBlanc's Random Family and V. S. Naipaul's India series, The Beautiful and the Damned is an important and incisive new work. The Beautiful and the Damned is a Publishers Weekly Best Nonfiction title for 2011. Siddhartha Deb, who teaches creative writing at the New School, is the author of the novels The Point of Return, a 2003 New York Times Notable Book of the Year, and An Outline of the Republic. He is also the author of the nonfiction book The Beautiful and the Damned: A Portrait of the New India. His reviews and journalism have appeared in The Boston Globe, The Guardian, Harper’s Magazine, The Nation, New Statesman, n+1, and The Times Literary Supplement.